Today's highly skilled guest set the gold standard for Detroit Tiger pitchers and, for a time, lefty pitchers in general. From 1964 to 1974, he annually won at least 14 games, topping out at 25 in 1971. 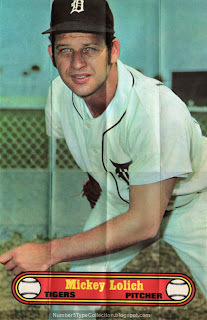 That year's performance included a league-leading 308 Ks and placed him a close second in Cy Young voting to Vida Blue. He pitched even better in 1972, lowering his ERA to 2.50 and raising his K/BB ratio to a career-best 3.38. A world champ with 1968's squad, he memorably threw 3 complete game victories in the World Series, the only lefty to do so in MLB history. Topps used above-average photography in this 24-count set of 10" x 18" posters, a nice change from the questionable choices made in other 70s sets. (Really? A half-shadowed Hank Aaron tracking a pop fly? That's the best you got?) Companies should remember that collectors appreciate more than just the name on the card. 1972's better set quality probably explains the higher values, as they cost more than most contemporaries. (Only the super-sized, full-team posters from 1969 price higher.) I bought Mickey Lolich in an eBay lot of 3 posters for $25 total, which included Tom Seaver and Willie McCovey. Philly Sports Cards' stock page (no personal connection) pictures a good chunk of the set and currently lists #5 at $10. Very nice. Do you display these or store them? If they're stored folded, is that a problem? Thanks! Although Mr. Lolich is kept folded for space reasons, I do display a 1969 Red Sox team poster in a large plastic sleeve. Easy conversation starter for longtime Boston fans! Once folded, the condition doesn't change if you keep them clear of moisture. Are you looking to display something similar? If I had collectd these things as a kid, they would have been all over my wall. It would have killed the value, but they would have been neat to have.